As the weather gets warm, we want to reach for something cold. How about a chocolate shake? Most of us need to drop the ice cream from this indulgence and it isn't hard if you own a blender. Snack Girl used to buy her blenders from Walgreens for $15 and then - she got married! Her friends, Rich and Patty, bought her a shiny new Cuisinart blender and it has lasted (along with my marriage) 7 years. I don't use it every day (maybe a few times a month), but it works great. I posted the link below. How do you make a 116 calorie chocolate shake that still tastes yummy? The key is unsweetened cocoa powder. We used it in the No Bake Brownie Balls and it gives this lovely bitter chocolately taste to the smoothie. It isn't super sweet. If you like it sweeter add more sugar, you will still be doing better than ice cream for the calories. This recipe is for 2 servings so be careful. If you aren't sharing with a friend, then use less milk and more ice to keep it within range. I wouldn't worry about the calories too much because this smoothie has 2.5 grams of fiber, 16% of your DV of calcium, and 6% of your DV of iron. Smoothies are a great idea for a snack. But, they should be savored. This is a sweet drink and (while healthy), your body doesn't register the calories in drinks as well as it does when you are chewing your food. Studies have shown that your body will not calorie adjust (eat less) after drinking a sugary drink. That is one reason why the government believes we should be taxing Soda vs. chips and candy. Liquid calories are more dangerous to your waistline than solid food calories. Toss in blender and blend until smooth. I love to make smoothies - I put in a banana, fresh or frozen fruit (whatever I have around), nonfat plain yogurt, soy or almond milk, usually vanilla flavored (or regular milk if you prefer), ground flax, a little bit of beet and now a little bit of spinach (a few leaves). My daughter usually loves it and my husband and I always do. I don't put in any extra sugars or sweeteners - you don't need it with the fruit and the vanilla flavored stuff. We love frozen treats in our family too! We usually make them with fruit but the chocolate sounds fantastic. We found that peaches or raspberries mixed with blueberries usually work the best for the consistency that we like although you can definitely use any of your favorite fruits. Also I love the Healthy Brownie recipe and can't wait to try this! The brownies look amazing! Thanks again for your tips and look forward to reading more. I second the frozen banana idea instead of ice. I like to use a frozen banana, some plain yogurt, and semi-frozen pumpkin to make pumpkin ice cream. I also add some pumpkin pie seasoning to taste. It's pretty thick when I make it, but adding some water or milk would make it more shake like. Try adding a couple of tablespoons of leftover cooked porridge to smoothies. It produces a thick & creamy texture for just a few calories. I have tried this shake tonight myself. I liked it but my kids didn't. It tasted too much like banana and not sweet enough for them apparently. I have used honey instead of the maple syrup. I'll be making it again for myself in the near future. I'll also try the frozen banana instead of the ice cubes next time. i do this kind of smoothie too. A few suggestions. Try Almond milk instead of milk, soy or rice milk. Fantastic! You can naturally sweeten anything, without adding calories, with Stevia or Xylitol ("Ideal" is a new brand). AVOID using artificial sweetners which are linked to all kinds of major health problems, including many types of cancers. Children esp should avoid all artificial sweeteners since their bodies are much smaller and the chemicals cause them greater long-term harm. About the 8th Continental Vanilla Soy Milk (Light) that one person said, I personally wouldn't buy it again. I scanned it with Fooducate (an app that Snack Girl talked about once that's availible in the App Store), and it's rated as a C (App rates things from A to D). It contains natural and artificial flavors, and some other things that I forgot. It's also more processed than regular cow milk because the ingredients list is much longer than vitamin D fortified milk. Does anyone have a trick for the frozen bananas? Whenever I freeze my over-ripe bananas for a smoothie, I find they are nearly impossible to peel for my smoothie- and the whole operation winds up taking more time than I have! I'm afraid they will turn brown if I pre-peel them. What do you do?? Thanks! Try peeling and mashing the bananas up and put them in separate baggies,for individual smoothies. They get mashed up anyway! Just peel and cut your ripe banana into chunks. 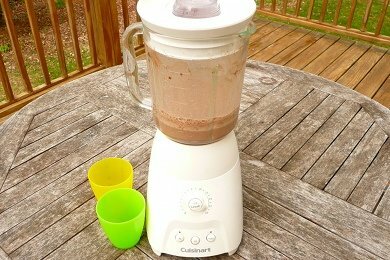 I used to make my kids banana "ice cream" by simply taking frozen banana chucks and processing in my little food processor until smooth. Maybe a few splashes of milk if you want. I do them now for my granddaughter but no milk due to an allergy. Don't knock it until you have tried it: Add some fresh grated zucchini to your smoothie! (about 1/2c ). The zucchini adds virtually NO taste but gives a very creamy texture to the smoothie, plus all those vitamins and fiber for just a few meager calories! Works with both fruit or protein shake style smoothies. I have been on the P.I.N.K. diet since January. The shakes they promote on that diet consist of whey protein powder and fruit. You may be able to throw in a scoop of chocolate whey protein powder with the banana or even some strawberries! I like the recipe but I use frozen banana,cacao,& almond milk.Delish! Does anyone know what the Pointsplus points system for this would be? I make this smoothie also, and I figure there is only points for the milk, which I add only 3 tbls. I use 1 point for it.